Put eggs in a pot. Cover with water room temperature and add salt to taste and bring to a boil. Reduce heat and gently boil for 12 minutes. 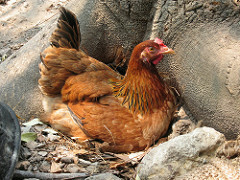 Remove from heat and cool eggs in cold water. When cool enough to touch, remove shells and cut the eggs in half using a string to cut them. Place the yolks in a food processor. Add juice from on small onion, pepper, coriander murri, oil and salt to taste. Knead until adough is formed. Stuff each half of the egg whites with the yolk mixture. Place each half egg over a half of an egg and secure with a toothpick. Garnish with white pepper and serve God willing. 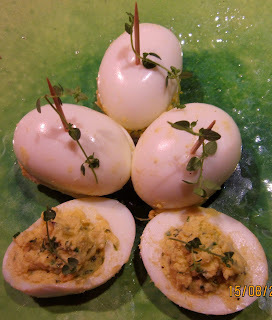 See blog titled banastas published February 6, 2012 for Fadalat’s #310 version of stuffed eggs. See L. Benavides-Barajas, La Alhambra, 1999:110 for his elaborated interpretation of this recipe. See A.Díaz Simón’s Recetas con Historia, which combines and elaborates the Al-Andalus recipe with Fadalat. See A. Díaz Simón’s Recetas con Historia, 2011:129, which combines and elaborates the Al-Andalus recipe with Fadalat. I had to look up murri. Interesting! It sounds much like Japanese miso paste. Its very interesting that there is a parallel between the East and the West. Yes, the Roman sauces are compared to Japanese sauces.